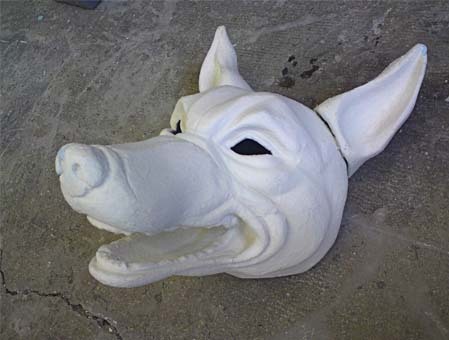 My dog head carved from styrofoam whilst at Blind Summit in 2008. He was initially carved to assist in exploring the construction of dog puppets in the early stages of a production of Jack London’s ‘Call Of The Wild’. The production eventually developed into what has been described as a “Cardboard Puppet Arctic Ballet” and was performed at the Webber Douglas Studio by degree students at Central School of Speech and Drama.